I've rarely been known to knit only one project at a time. After only 11 days (and it hasn't been non-stop knitting), Ramona is almost finished. A fairly plain sweater with heavy yarn and large needles goes quickly. I'm anxious to get back to lots of colorwork and to start my Anatolia sweater from Rowan 54. From the moment I saw it in the magazine I knew that I was going to make it and immediately ordered the yarn. That was about 6 months ago. The sweater is very pretty, but there are some things that I'm going to change. First of all, the pattern has you knit the body flat, then the yoke is knit circularly. I'm comfortable with doing fairisle flat as well as in the round, but I think it'll work up quicker if I do the body circularly. I'll work the sleeves flat, however, as I don't like doing fairisle on double pointed needles and I find 12" circulars to be a pain to work with. Also, I've never taken to the magic loop method. It's the "can't teach an old dog new tricks" syndrome. I can be a bit stuck in my way. Moi? The other thing is all that ribbing around the hips and on the sleeves. It way too much for my taste. Instead, I did a provisional cast on and, since I'll be working about half as much ribbing, I need to add something to maintain the length. 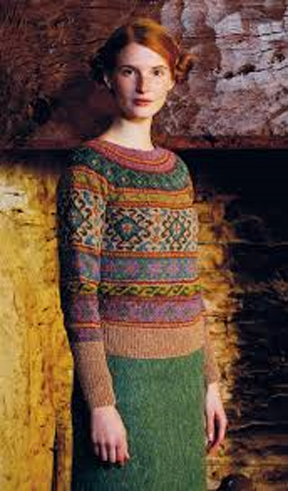 I'm going to repeat one of the fairisle bands used in the sweater. There are two to choose from that are about the right length. The first is around the model's waist area and the other is in the yoke, just above the armholes. I think I'll use the upper band as I don't want two bands that are the same to be so close together. I'll probably have to do a bit of math to be sure that the additional band will fit comfortably into the number of stitches I have to work with. When the sweater is finished, I'll think about the ribbing and what I want to do about it. That won't be for a while yet. I've only just cast on! The turquoise yarn is my provisional cast on. 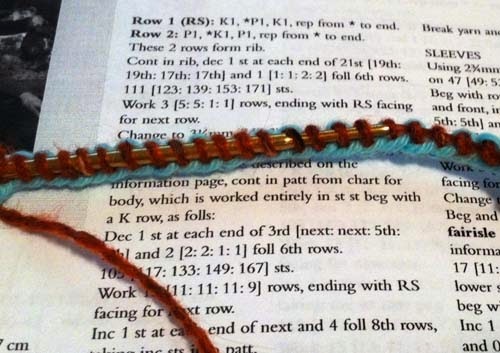 I've done a whopping one row of the pattern, a plain knit row in the Ginger color. Yahoo -- let the *adventure* begin, rather!